With the 2015 summer weather maintaining temperatures above 34 degrees Celsius, everyone is encouraged to find a way to cool down. From becoming a mermaid from the vast seas covering the archipelago to simply chewing on shave ice delights like the Filipino Halo-halo. The Halo-halo is a desert mixture where ingredients like the jackfruit, kidney beans, garbanzos, sugar palm fruit (kaong), coconut sport (macapuno), gulaman, tapioca, nata de coco and pounded crushed young rice (pinipig) is placed at the bottom of the glass followed by a tall layer of shaved ice and topped with leche flan, purple yam (ube) or ice cream, which is finished with a generous serving of evaporated milk upon serving. I've had this delectable desert for as long as I can remember, and I decided that I wanted something a little different. It just so happened that my friend mentioned, Cafe SeoulHwa, a Korean cafe in global city that could satisfy my curiosity. A Traditional Patbingsu is topped with choped fruits, condensed milk, fruit syrup and Adzuki beans! 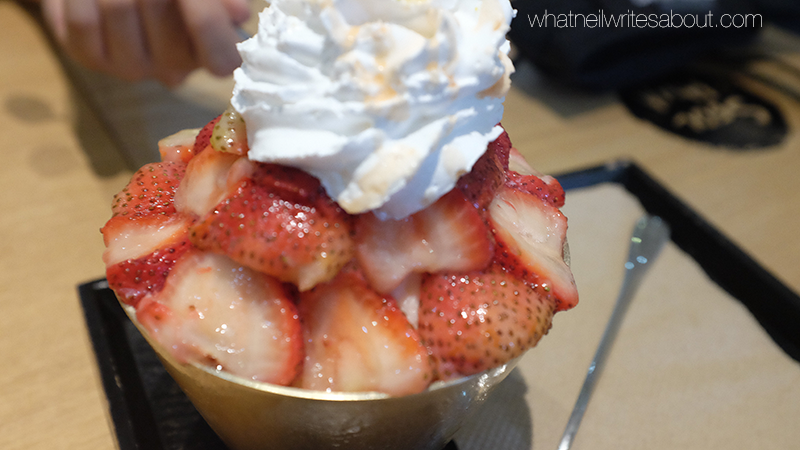 They specialize in the Korean shaved ice desert called bing-su which was derived from Patbingsu (Patbingsoo or 팥빙수) which literally translates to red beans with ice. It is made with shaved ice topped with chopped fruits, condensed milk, fruit syrup and Adzuki beans. As mentioned earlier, the cafe specializes in Patbing-su and with bing-su variations like the strawberry bing-su, the chocolate brownie bing-su and the Wine bing-su. 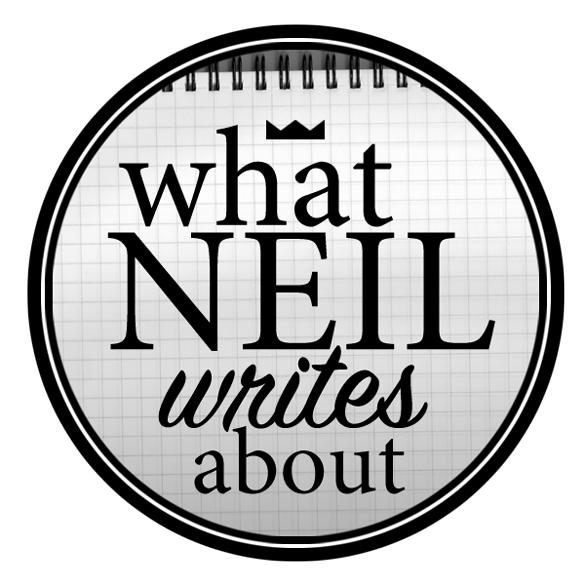 You are welcome to satisfy your curiosity here. In fact the one manning the cashier is a of Korean descent. He speaks fluent English though so it won't be that hard to find what you will like. So I googled the place the night before, and planned my route. I contacted a friend of mine because I had a feeling that she would like to try something Korean, I mean different. 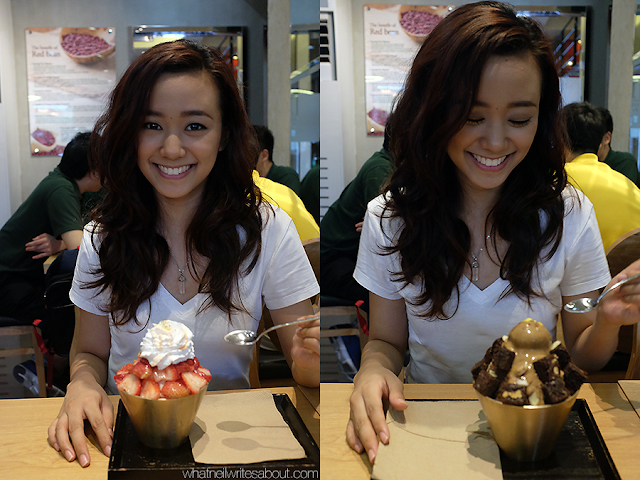 You may know her from Pinoy Big Brother 2014, Jayme Jalandoni. Cafe SeoulHwa can be found at the Second floor of the Forum South Global complex near the corner of 7th ave. and the 26th ave meet at the Fort Global City. The facade of the cafe is all glass with an embossed signage lining the top of the glass panels. As you enter you find the counter on the right and the tables and chairs on the left up to the back of the room. 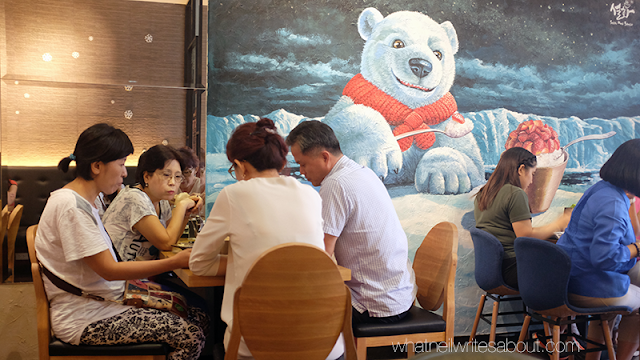 The walls are decorated with murals that evoke a frozen paradise like an adorable penguin that resembles the one from happy feat and a friendly polar bear eating a strawberry bing-su. In between the murals are informative posters that have pictures and trivia about the different kinds of bing-su. The lightning from the outside brightens the room, and is complimented by the soft yellow-orange lights that illuminate the murals, posters and tables. You may know her from PBB 2014, Jayme Jalandoni! 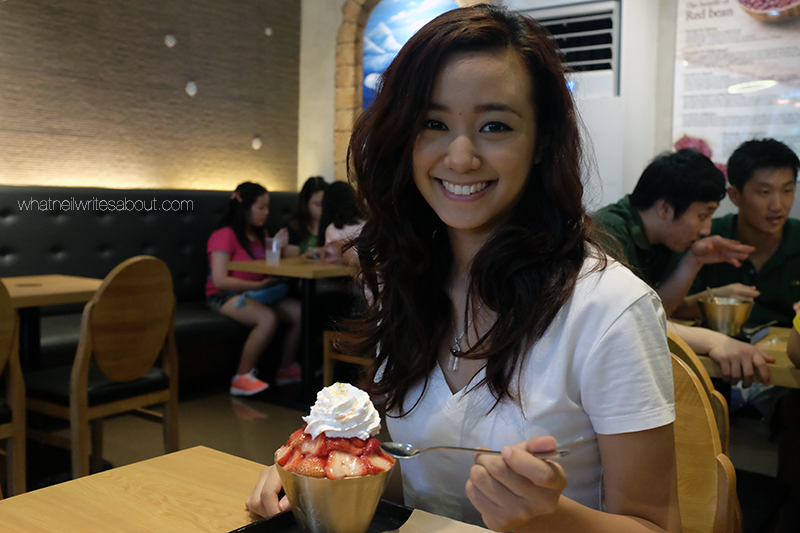 I have always had an affinity for sour fruits like berries and green mangoes; hence, I chose the strawberry bing-su. Jayme on the other hand picked the brownie chocolate bing-su because chocolate and girls are almost always together. 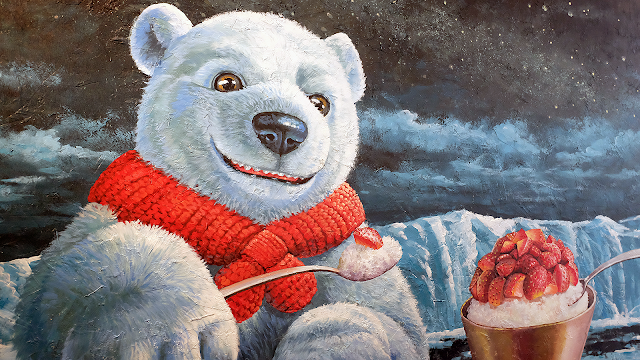 When I took my first scoop I got a whole slice of strawberry and a portion of the shaved ice. What I noticed right away was that the shaved ice is a lot thiner and finer than what I am used to. Shaped like thin needles that quickly melt in your mouth releasing the sweet flavors of the syrup and the condensed milk which compliments the sourness of the strawberry slice in my mouth. It was wonderful dance of flavors that refreshes you at the same time. For the ones with sweet teeth, the brownie chocolate bing-su might be for you. The sweetness of the syrup, condensed milk with the needle like shaved ice is still there but with chocolate and chocolate brownies. If you've ever had chocolate syrup and chocolate cake with chocolate brownies then you already know how it will taste but with the fine shaved ice consistency. It was too sweet for my taste but this is me. Once I arrived I was immediately greeted by the staff. They were lead by the man at the cashier who is of Korean descent but speaks english fluently. The staff was kind and patient with a first timer like me. I asked quite a bit of questions like what is a bing-su, what are the variations, and quite a lot more, and all of them were answered in a moderate volume soft spoken voice. It was surprisingly reassuring. The bing-su arrived at around ten (10) minutes after we ordered, and were kind enough to give me us some extra tissue upon request. Although they focus on Bing-su they are still a cafe and serve coffee, tea and ice blended beverages. These can vary from expressos, lattes, yoghurt, shakes, smoothies, and teas. So you can practically bring the whole barangay here and have something for any one especially if you just want to sit down and cool off from the Summer Manila Weather. 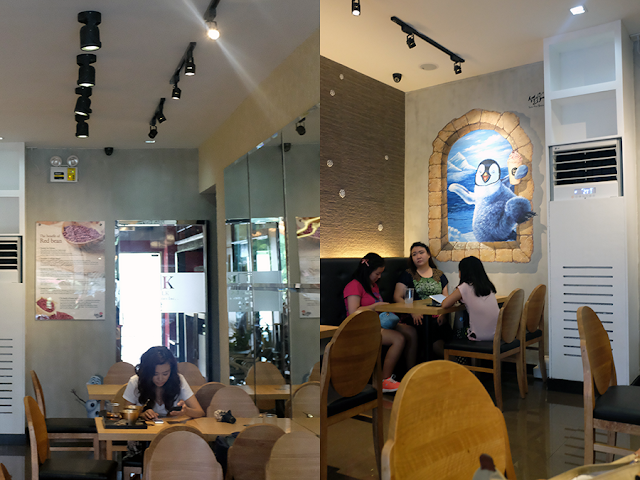 They also have a set menu for a combination of the bing-su and the nutritious desserts or sandwiches that start at Php 360.00 and max out at Php 420.00. The rest of their beverage collection start at Php 105.00 and can max out at Php 200.00 per beverage.